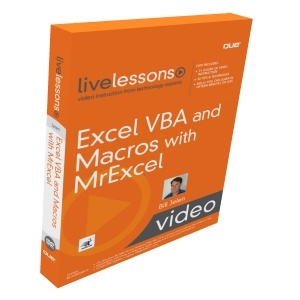 The Excel VBA and Macros DVD-ROM with MrExcel delivers the power of the best classroom training with over 7 hours of instruction covering 50 lessons. Each lesson begins with well-defined learning objectives and ends with comprehensive summaries. OS: Windows 98, 2000, XP, and Windows Vista; Mac OS X; versions of Linux with the Flash 8 Player or later. Multimedia: DVD drive, an 1024x768 or higher display, and a sound card with speakers. This DVD is based on the Microsoft Excel 2007 Version and is valid for Excel 2010 as well.